There were 84 deceased organ donors in 2017, the most ever recorded in a single year in Alberta. A large part of the increase is related to a new procedure that started being performed in Calgary only two years ago. Eighty-four people who died in Alberta last year donated their organs and one of them happened to have a liver of the right size and blood type for Amy Montgomery. The Calgary resident is 34 years old and was born with a rare liver disease. She knew she'd need a transplant at some point in her life, and that day came last November when she went into full liver failure. "I don't want to just sit here and die," she remembered thinking to herself, as she waited for a donor match. She counts herself lucky to have found that match after only two days. Last year, 35 Albertans died while waiting for a transplant that never came. Hundreds more are still waiting. Montgomery, who has a seven-year-old son, knows her disease means she may need a second transplant later in life. But she's encouraged by the increasing number of people donating their organs after death. The 84 donors in 2017 were the most ever recorded in a single year in Alberta, and a large part of the increase is related to a new procedure that started being performed in Calgary only two years ago. Known as donation after cardio-circulatory death, or DCD for short, it sees doctors procure organs from consenting patients five minutes after the heart stops. This expands the pool of potential donors. It also contrasts with the recent past, when donations primarily came from patients who had suffered severe head injuries and had already been declared brain dead. The new method was adopted at the University of Alberta Hospital in Edmonton in 2009 but didn't start happening in Calgary's Foothills hospital until March 2016. There were just three donations via DCD in Calgary in that first year, but in 2017 that increased to 11. 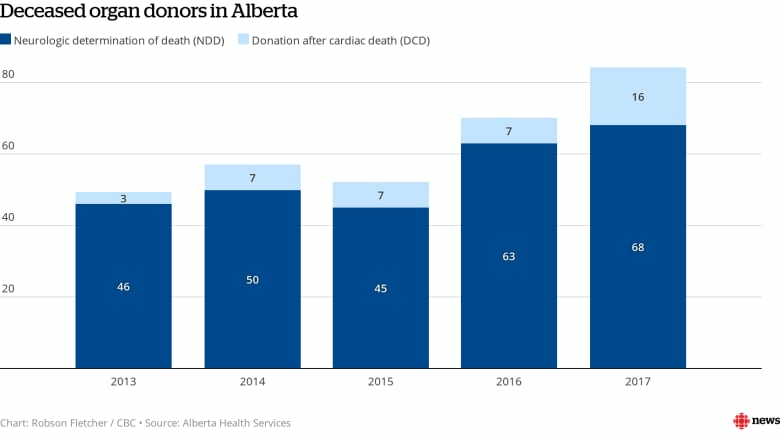 Dr. Andreas Kramer, medical director of the Southern Alberta organ donation program, says NDD, or "brain death" cases, still account for the majority of donations, but DCD is catching up. "In fact, the numbers will be even substantially higher in 2018 than what you see for 2017," he said. Across Alberta, 16 of the 84 deceased organ donors last year came via DCD. That mirrors a national trend. In 2013, DCD accounted for 12 per cent of deceased donors across Canada. That grew to 25 per cent in 2017. And while it's been in practice in Canadian hospitals for more than a decade now, Kramer said it took some time for physicians to accept the change. "Going back to 2006, I would say it was still a fairly controversial practice," he said. "And there are certainly some ethical issues that need to be considered." Those include the thorny question of when somebody is actually dead. In Canada, doctors must wait five minutes after a patient's heart has stopped before beginning the organ-procurement process, to make sure it doesn't start beating again on its own, something Kramer said "can very rarely happen." Health authorities in other countries have mandated different wait times for DCD. These range from as little as 75 seconds to as long as 20 minutes. It's a delicate balance, Kramer said. On the one hand, doctors must be certain a donor has died before starting to cut out their organs. But, the longer you wait, the more damage that can be done to those organs. ​"The organs do potentially sustain some injury because of the low oxygen levels and the low blood pressure," he said. "So when their organs are then transplanted into a recipient, they may not function as well, initially." Kramer said a person who receives a kidney via DCD, for example, may still need dialysis for days or even weeks after the surgery. But, for the most part, he said organs procured by this method end up eventually working about as well as those procured via NDD. Kramer said the growth in DCD is largely responsible for the increasing rate of deceased organ donation across Canada. Alberta still trails behind the national rate, but that's because both have been growing at roughly the same pace. The province had a rate of roughly 19 deceased donors per million residents in 2017. The national rate was closer to 22. For Montgomery, it all adds up to an encouraging trend not only for herself in the future, but for everyone in need of an organ. "I consider myself probably one of the most fortunate people in that situation," she said, noting her two-day wait for a liver is "not the norm." She said she couldn't imagine what it would be like to wait months for a donor match, knowing death draws ever nearer with each passing day. "Every time your cellphone rings and you look at the number — that, in itself, would be so difficult," she said. "I was just so lucky."